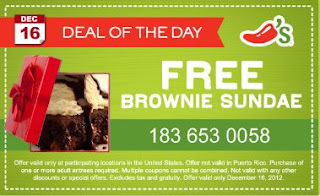 Stop by Chili's today & get your free Brownie Sundae for their Holidaily deal. They are giving away one free item a day for Christmas. Chili's is celebrating the holiday season at their Chili's locations with a special offer every day from now until December 24. Just print their coupon, go to your favorite Chili's location and enjoy. * Happy Holidaily from Chili's!